A string test is performed to detect the presence of intestinal parasites. 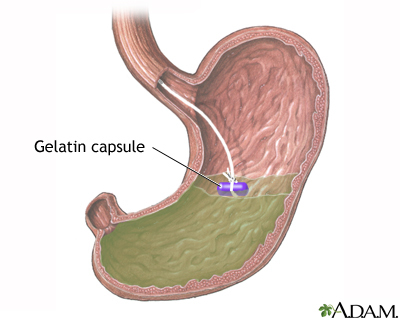 A weighted gelatin capsule attached to a string is swallowed and left in place. After about 4 hours, the gelatin capsule is pulled out of the stomach by the string. Any bile, blood, or mucus remaining on the string is examined under the microscope for cell types and segments of parasites or eggs. Reviewed By:Subodh K. Lal, MD, gastroenterologist with Gastrointestinal Specialists of Georgia, Austell, GA. Review provided by VeriMed Healthcare Network. Also reviewed by David Zieve, MD, MHA, Isla Ogilvie, PhD, and the A.D.A.M. Editorial team.